Fizzle in it's box. Grey wires are the ground plane, orange wire to the right is the 1/4 wave antenna. FIZZLE is an 869MHz Balloon GPS Tracker based on the CRAAG2 PCB. FIZZLE transmits on 869.5MHz, this band allows use of 0.5W ERP when airborne, with the restriction of using channel access techniques or a 10% duty cycle. Using the RFM22B transceiver module, the tracker listens before each telemetry string, and then transmits with 100mW. FIZZLE transmits on 869.5MHz, this band (869.4MHz-869.65MHz) allows the use of 0.5W ERP when airborne, with the restriction of using channel access techniques or a 10% duty cycle. Using the RFM22B transceiver module, the tracker listens before each telemetry string, and then transmits with 100mW. In the case of a channel being assessed as 'busy', the transceiver will fall back to 10% duty cycle. The antenna used is an inverted quarter-wave with ground plane, similar to my previous 434MHz flights. This flight is an assessment of the capabilities of the 869MHz band, along with the use of SDRs (such as Funcube Dongle, rtl-sdr) for receiving telemetry. In the case of a positive outcome, I plan to investigate the use of QPSK at around 500 symbols/s for telemetry. With the use of SDRs, increased symbol-rates should not be an issue, allowing use of error-correction coding (maybe implementing CCSDS recommendations on more powerful platforms, see CRAAG3). The tracker is enclosed in a box made out of two blocks of polystyrene, with depressions carved out to house the PCB and battery holder. The edges are also alternately carved out so as to interlock for increased thermal insulation. 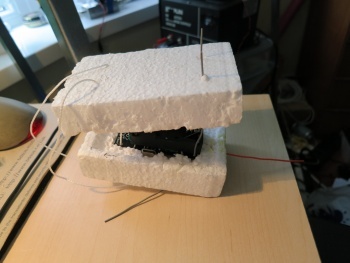 The tracker is suspended on two loops of cord that go through both pieces of polystyrene, and through the holes in the CRAAG2 PCB, so as to retain the tracker hardware if the box is compromised. The telemetry string from FIZZLE is long, as the baudrate is fast and so a lot of information can be sent very quickly. The entire string is sent approximately every 1.2 seconds. uBlox MAX-6 running at 5Hz update to allow query of lock, position, time, speed+heading. B - Booting, GPS not yet initialised. U - Float detected, powersaving enabled. Battery is 2xAAA Energizer Ultimate Lithiums. These are subject to change after battery testing. Measured from the AVR internal sensor and adjusted for ambient air. Measured from the RFM internal sensor. Measured from the RFM22B in RX mode. Given in dBmW. Mostly shows -113dBm. -112dBm and -110 dBm have been seen in testing. Channel threshold was set to the signal received after free-path loss of a 50mW transmitter at 100m, minus a few dBs. This page was last modified on 25 February 2013, at 20:39.